For years I’ve listened to friends describing their visits to Machu Picchu as magical and mystical so when I saw the description of a trip to Peru combining hiking and a two-day visit to Machu Picchu, I signed up immediately. I’m 81. How many more years do I have to go on travel/hiking vacations? I tried not to worry about whether I could hike up passes of 14,500’ or more and worked with a friend who helped me train by leading hard, long hikes at altitudes up to 12,400.’ I left for Peru feeling I was as prepared as I could be. We began our hikes at the end of the rainy season by climbing up gorgeous, green mountains with lakes that shimmered in the sun. Local guides carried our supplies and extra water on horses or mules. Each day that we hiked, the chef had to hike up to the designated lunch place to prepare our meals. Talk about gratitude! Every lunch and dinner the chef made a special gluten-free, dairy-free meal for me. It started to rain, hard. I should have put on my raincoat and pants but I was too tired, so I just put on a rain poncho. Bad idea. I got soaked. Fortunately, a copious three-course lunch was served in a tent so we had a chance to dry off –except when we had to pee, which meant going outside again. After lunch, the sun came out and we warmed up. It was a glorious day. One day we had a choice between a cultural experience and a hike. I was torn since I wanted to do both. I chose the cultural experience and was the only person in the group to do so. I had a driver, car, guide, and personal chef. When we arrived at the old Inca town of Choquecancha I was greeted by one of the weavers with rose petals in a flower-garlanded arch. She introduced me to two other weavers and they appreciated that I spoke in Spanish even though some of what I said made them giggle. I showed them photos of my weavings and that established an immediate bond between us. 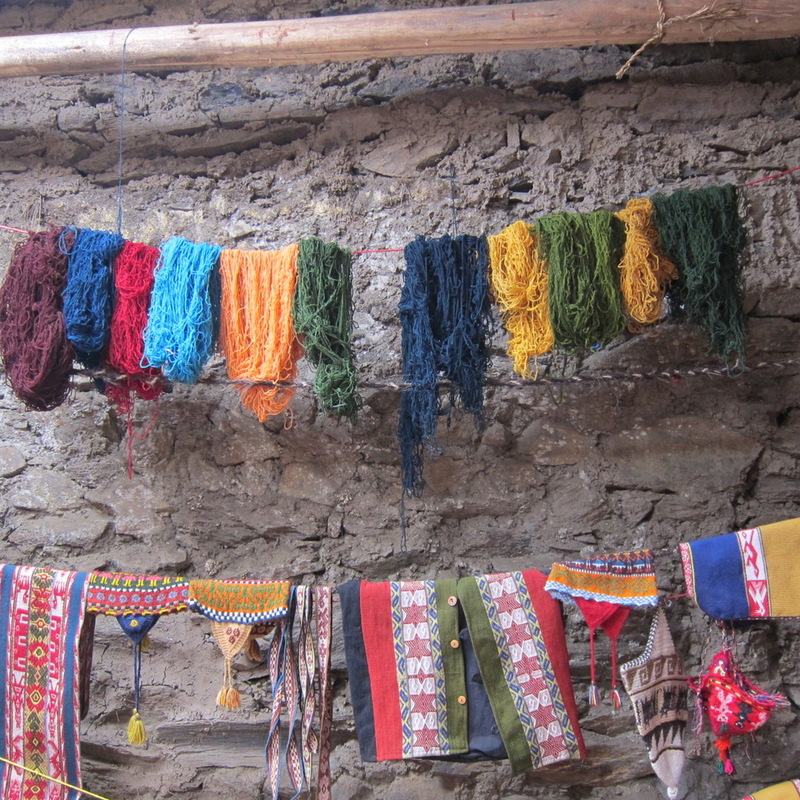 They showed me their work and the way they dye, spin, and weave. When the chef prepared my special meal, the driver, guide, and chef wouldn’t eat until I had, but I persuaded them to join me. What a relief. More giggles at my Spanish, but their laughter felt caring. While walking down a street in another small village, I saw a little girl coming toward me so I bent down to say hello. Much to my surprise she cocooned into my body and pressed herself against me. I asked in Spanish what her name was, how old she was, and told her my name, but she remained quiet, continuing to snuggle into me. I held her gently, wondering how long she’d stay. Out of the corner of my eye I saw a woman walk toward me smiling. I asked in Spanish if she was the girl’s mother. She was. I asked her the child’s age and name. 2 ½. Numha. The woman kept looking. Her daughter kept snuggling. My thighs kept burning. Since the little girl didn’t move, I didn’t either. Finally the woman told the little girl they had to go, but still she didn’t move. When the woman took the little girl’s hand and said again that they had to go, the little girl gave me an enormous hug, then left with her mother. I stood up, amazed by the encounter. One of the guides witnessed what happened and came over to me. “You must have magic in you,” he said. I think it was the little girl who had the magic power of love. After hiking in the mountains with no tourists, walking on many Inca trails with no tourists, visiting evocative ruins with no tourists, and talking with local people, we took the train to Machu Picchu. When we arrived I felt assaulted. Too much noise. Too many tourists even though there were “only” 1,000 compared to 5,000 at high season. Unlike our visits to previous sites, it was difficult to sense the power and mystery I know was there. I felt a keen sense of disappointment. For me, hiking in the mountains of Peru and having a little girl hug me was infinitely better than visiting Machu Picchu. I know now that the road less traveled is the road for me.